In my ongoing process to better know the members of PS I Love You, this was a day dedicated to Gustafson Family Vineyards. As it turned out, this day felt more like being friends of the family, versus having a business foray into the wilds of Sonoma County. Climbing up the hill driving toward the Pacific Coast from Lake Sonoma in Dry Creek Valley, it seems to become the forest primeval, almost in seconds. In some areas there are redwoods, in others there are oak groves, and yet others are populated with madrones. 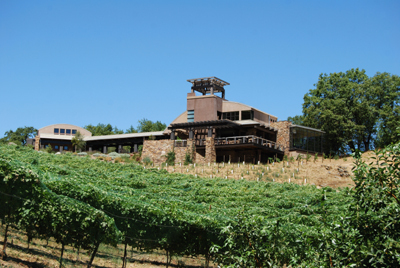 Gustafson Family Winery is an 87 acre property in the Dry Creek Valley appellation of Sonoma County. The old sheep ranch is at an elevation of 1,800 feet above sea level, and has rich, red volcanic soil, known for producing superb wine grapes. 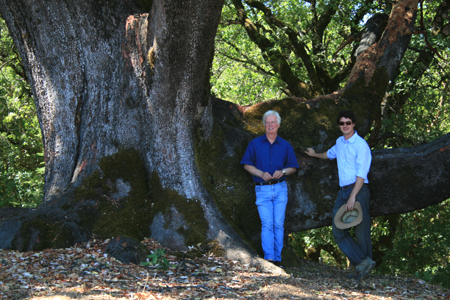 This image of Dan (left) and Emmett (right) is of the two of them standing in front of a historic madrone. It’s 11 feet wide, and is considered to be at least 300-400 years old. Dan, who recognizes that he’s simply a steward of this land, has inherited this tree with all of its historical significance. I was later to learn from Dan Gustafson (a landscape architect by trade), that where there are tree clusters, the soils in those areas are of a certain type, and that’s what supports that specific growth. This is also land of wild boars, and with these ingredients, makes for a great BBQ, when the population needs to be managed. 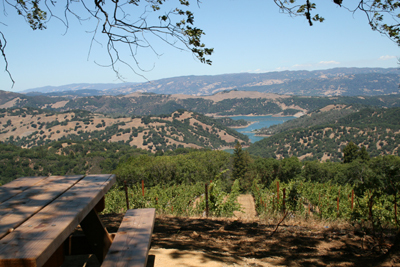 Gustafson Family Vineyards is on Stewarts Point Skaggs Springs Road, overlooking Lake Sonoma. It’s one of those vistas that just takes your breath away. It’s a destination, and well worth your time for a visit. It’s a winery where you can also enjoy a leisurely picnic lunch in the midst of a forest, with only the sounds of birds chirping and air currents flowing, all making for a remarkably relaxing adventure. I don’t know of any other picnic area in Sonoma County with a view this gorgeous and in such a tranquil place. I honestly believe that part of the charm is Dan’s landscape architecture background, a career that he still actively enjoys in Minnesota. So, I had to ask the question, “How difficult was it to create your beautifully landscaped winery?” Minnesota and California’s flora and fauna are in two separate worlds; most especially since one is a desert, and the other experiences such extreme cold spells. Most plants of one area (like succulents) can’t possibly survive in the other. Dan explained that he consulted with someone local, and the end result is a garden that he chose that would be low impact on the environment, not needing a lot of irrigation, and yet visually pleasing ~ no matter which way you turn, honestly. On this day, we experienced such extreme hospitality, which I can only attribute to the fact that Dan and his family come from the heartland. I’m from the east coast, where I know natives tell it like it is. (Ya can’t get theyah from heyah.) I’m now living on the west coast, where I’ve learned a lot about equivocal language – the other side of telling it like it is. (“Do you mind moving one step to the right, because right now my foot seems to be under your foot?”) Meanwhile, Dan’s from the heartland, where it all just seems to come from the heart. (Welcome. We love having you!) I learned this heartland culture while doing sales in Iowa, Ohio, Minnesota, and Missouri. Being in their culture, I found it to be warm and welcoming. Dan’s brought that same culture to Sonoma County, and it was clearly demonstrated on this day. 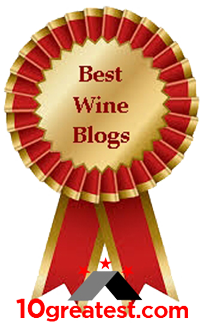 I have a side story to this one, but well worth telling, because it will give you an idea of what to expect, when you, too, visit Gustafson’s winery. Jose and I had just arrived, and were instantly greeted by Dan’s winemaker Emmett Reed. Emmett showed us where to park, then had us go immediately to their tasting room. Here, Dan, his daughter Kristin and her two children (the three of them visiting from Minnesota), and Emmett’s two winery dogs (Samson and Rampage) were eagerly awaiting our arrival. Dan explained that he would have to excuse himself shortly, because he had a young couple from Ohio about to also arrive. And, within minutes, Jim and Tamera did indeed arrive. Since we were also with Emmett, nothing skipped a beat, as we all went our separate ways for a bit in the tasting room, learning about Gustafson wines. The fun part of how Jim and Tamera got there is that Dan had been down in the town of Healdsburg the day before. 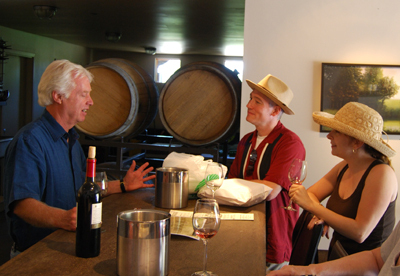 Dan gregariously started a conversation with Jim and Tamera, which led to Dan inviting the couple to picnic at his winery. This, for me, is very reminiscent of Robert Mondavi, who – to get people to his winery – used to drive up and down Route 29/128, slowing his car just before his winery. This piled up the cars behind him, and then he’d put on his blinker, and s-l-o-w-l-y turn into his winery’s driveway. People just followed Robert, because they were looking for a place to go. Dan’s got that same passionate grassroots, gonna get it done attitude, in a very quiet, but knowing, way. Jose and I learned that winemaker Emmett has previously worked at two other wineries, under the direction of Kerry Damskey. 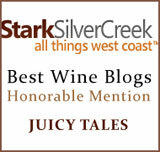 Kerry is a master wine maker, with whom I first became familiar while doing PR for Charles Creek Vineyard. 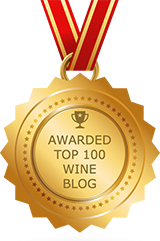 From the instant I began working with proprietors Bill and Gerry Brinton’s brand, the gold medals and high scores were flying into the winery… And, this was a brand new company. With the Brintons, from the start until today, nothing but the best will do. Their gold medal standards told me – back then – all I’d ever need to know about them and Kerry… Kerry’s got the magic touch. How fortunate Emmett is to have worked with him prior to Gustafson. 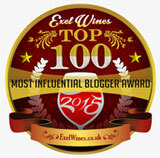 It’s given Emmett a strong background for knowing how to craft delicious, award winning wines. This completely prepared him for working with Dan Gustafson; because on this day, I learned that Dan falls into the same quality standards category. 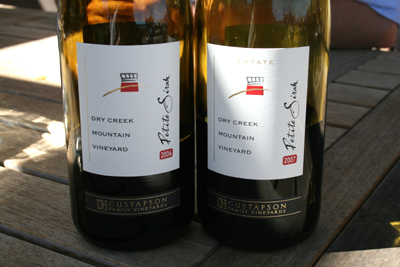 Tasting the wines with Emmett, proved that for the Gustafson Family wines… They’re as rock solid as the mountainside where the winery and vineyards are perched, and the wines are meticulously crafted. It’s also interesting to note that besides now being a vintner, Dan is still an active landscape architect and real estate developer in Minnesota. He continually goes back and forth between Sonoma County and Minnesota, enjoying two equally separate and rewarding worlds. In the spring of 2002, while driving from Healdsburg to the California coast with my family, I pulled my car to the side of the road and, and peering over the fence of the property that would soon become his, explained to everyone in the car that this would be a perfect place to grow grapes. 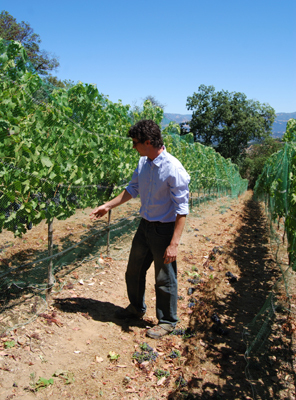 My dream of planting my own vineyard came true that year, with the purchase of those 87 acres in the Dry Creek Valley. The old sheep ranch, at an elevation of 1800 feet above sea level, has rich, red volcanic soil known for producing superb wine grapes. In 2006 the estate property was expanded to 247 acres with the purchase of an adjacent property. Vineyard plantings are now complete at 20 acres; varieties include Zinfandel, Petite Sirah, Syrah, Cabernet Sauvignon, Cabernet Franc, Petite Verdot, Sauvignon Blanc and Riesling. The balance of the land will remain as an ecological preserve.